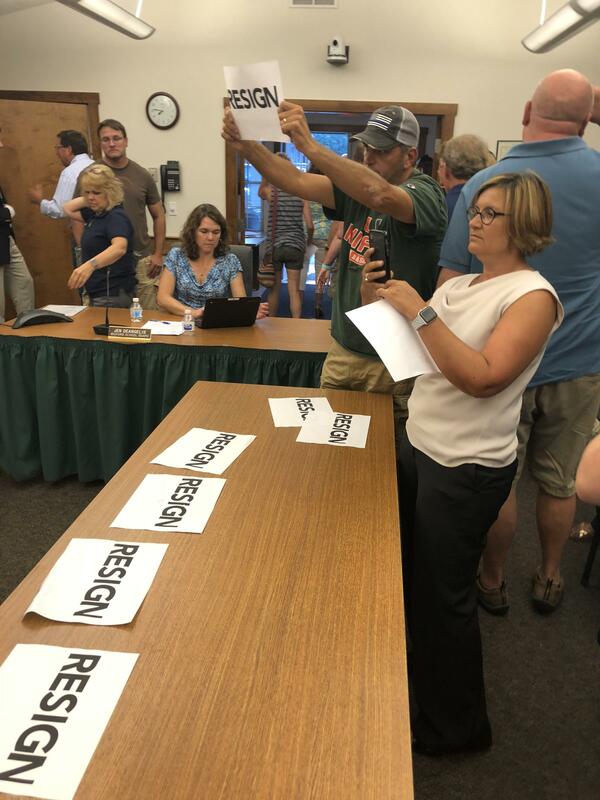 Parents at a recent Bedford school board meeting held up signs calling on Superintendent Chip McGee to resign. Superintendent of Bedford Schools Chip McGee resigned today after public outcry over his decision to authorize a district staffer to testify on behalf of Kristie Torbick, a former Bedford guidance counselor convicted of sexually assaulting a 14-year-old student in Exeter. "It would be difficult for me to continue to lead the Bedford School District at this point because of circumstances beyond my control," he wrote in a statement on the school district's website. "I do not want to become a distraction from the continued good work happening at Bedford." Kristie Torbick plead guilty to four counts of felonious sexual assault on July 9th. At her sentencing hearing, three Bedford Public School staffers submitted character witness statements to the judge. Bedford High School Dean of Students Zanna Blaney, who read her statement in court, said that it was "[her] pleasure" to testify to Torbick's character. Listen to an audio version of this story. "I never had any concerns about Kristie's conduct when working with our student population," Blaney said. "In fact, at the time, she was far and away the strongest school counselor in the department of six." Bedford guidance counselors Alison Mattson and Christine Mulchahey also submitted statements, but did not read them at the hearing. Mulchahey wrote that Torbick was "devoted to teaching students how to be their most healthy, best selves." Bedford Superintendent of Schools Chip McGee announced his resignation July 27, 2018, after controversy over a staffer's testimony on behalf of a former counselor during a sexual assault trial. Torbick was sentenced to 2 1/2 to 5 years in prison, a lighter sentence than the 5 to 10 years sought by the prosecutor. Superintendent McGee issued a statement on July 11 responding to questions about why the district authorized Blaney's testimony. "Several weeks ago, the attorney for Kristi Torbick contacted the school guidance department at Bedford High School," McGee wrote. McGee said that Blaney "agonized" in those weeks over whether to provide information about Torbick's time as a Bedford counselor, and that he ultimately authorized her to read from performance evaluations she had written about Torbick. McGee later clarified in an interview with NHPR that the request for character testimony had been addressed to Blaney as an individual, not to the Bedford High School guidance department. Emails obtained through a Right-To-Know request filed by Bedford residents also show that Blaney drafted a character witness statement and submitted it to Torbick's defense lawyers for edit on April 27, 2017, over a year before McGee stated that she asked him for the district's permission to do so. Monday's emergency meeting of the Bedford School Board, which is investigating the situation, was closed to public comment. Still, over 50 parents attended, a dozen of them carrying signs containing a message for Superintendent McGee: "Resign." 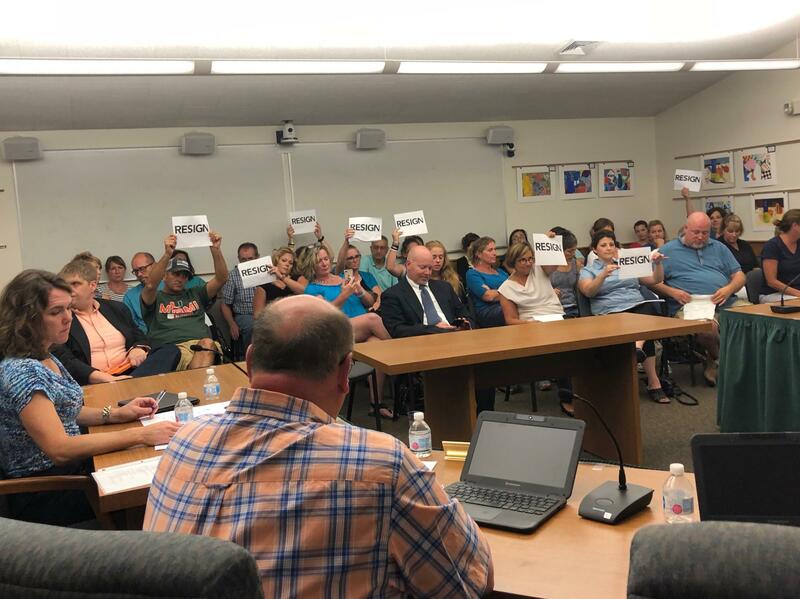 Danny Genese and Jannette Mooney were among about a dozen Bedford Parents who held signs calling for Superintendent McGee's resignation at Monday's School Board meeting. Danny Genese was one of those parents. Today, he said that that McGee's resignation gives him confidence that the district is taking "appropriate action." But for him, and many other district parents, it's only the first step in resolving this issue. "There is still a matter of very serious concern to be addressed with respect to the Dean of Students and two other counselors remaining in their positions at Bedford High School," Genese said. The Bedford School Board will hold its next public meeting on August 13 at 7 p.m.
Bill Kassler, the Board's spokesperson, said that he expects this meeting to be open to public comment. In statement posted on the Bedford School Distric website, the school board said it accepted the resignation, effective today, and that McGee had "served this district honorably for many years. He has our gratitude and respect. We wish him well." 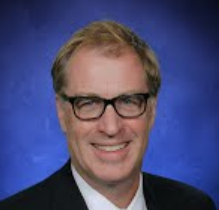 The board appointed Mike Fournier, principal at the McKelvie school, to serve as interim superintendent. Jennifer Asdot will be nominated as interim principal at McKelvie. With a month left until the first day of school in Bedford, Fournier said today that he will try to balance parents' immediate personnel concerns with fairness for the staffers involved. "I feel a sense of urgency with respect to parents' concerns," Fournier said. "But in order to get through this fairly and ethically, we need to follow due process." Parents in Bedford are calling for action after district officials allowed Bedford High School Dean of Students Zanna Blaney to give character testimony on behalf of Kristie Torbick, a former district counselor who plead guilty to sexually assaulting a 14-year-old student in Exeter. At Torbick's sentencing hearing earlier this month, Blaney described her as a "pro when it comes to making a student feel heard" and said she had never been concerned about Torbick crossing boundaries with students.